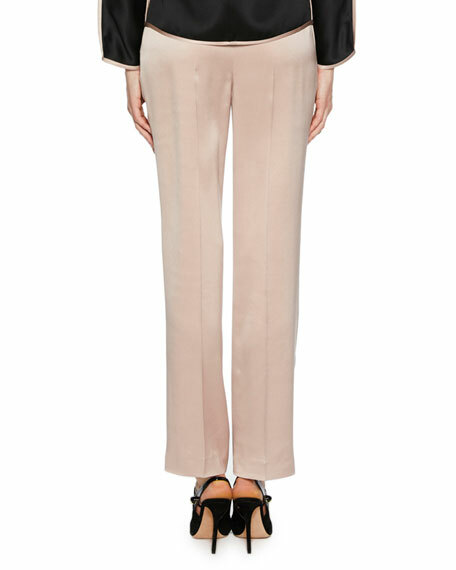 Giorgio Armani mulberry silk satin pants. Giorgio Armani silk pants. High waist with rib cage. Hidden side zip. Slim fit through straight legs. Lining, acetate/cupro. Made in Italy. Giorgio Armani pants in striped cotton-silk blend. Natural rise; hidden hook-zip fly. Adjustable waist belt. Side slip pockets. Back welt pocket. Relaxed fit through wide legs. Ankle-length. Cotton/silk. Made in Italy. Giorgio Armani mulberry silk pants. Hidden hook-zip fly. Pleated front. Side slip pockets. Relaxed, tapered legs. Lining, acetate/cupro. Made in Italy. Giorgio Armani pants in stretch wool. Mid rise. Side slip pockets. Straight fit through legs. Full length. Hook/zip front. Virgin wool/spandex. Lining, polyester. Made in Italy.